Thank you, Susan! Glen has been so sweet, insisting on driving me to the store and to have lunch with him. If it weren’t for him, I’d be up a creek. Either that, or Katie would’ve had to stay longer! You poor dear. Glad you have Glen to swing into action, better breakfast tacos and all! Have you thought about voice recognition software? I know little about it, but it’s a pretty mature product by now. A cautionary note, be sure you are getting the best hand care possible, even if it means bruising your current doctor’s ego. These guys are big boys and can take it. You, on the other hand (no pun intended), only have one, well, really, two. 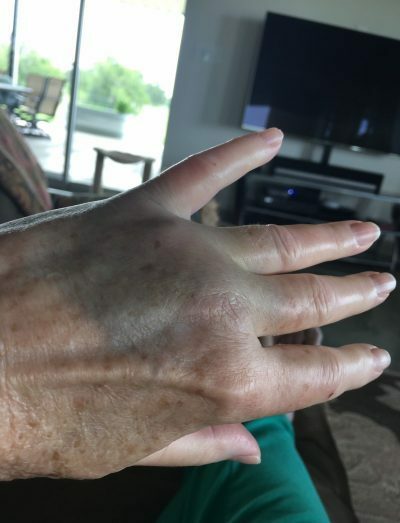 My Sue cut a tendon in a finger and it was not properly treated and caused all sorts of problems down the road, even though she had the best care possible after the fact. That picture looks like a real ouchy! Voice recognition software! No, I haven’t, John, but thank you for suggesting it. I’ve been using pen and paper, and typing is getting a little bit easier now too. I hope I won’t need to look into it. As far as care goes, I haven’t had any. Stupid, I know. But when I broke my right hand years ago, the ER doctors couldn’t do a cast for some reason. Can’t remember why. They only wrapped it in something and put a sling on me. It drove me so crazy I lasted only about 3 days with it and then ripped everything off. I can’t imagine what I would’ve done with a cast. And now, our deductible is so high that every bit of care would come out of our own pockets. Since I won’t allow them to put a cast on it, I’d be paying for x-rays and for them to tell me that I have a broken knuckle at the base of my ring finger (and maybe also a bone nearby), which I already know. I have a feeling it’s going to be a bit deformed for the rest of my life. I’m afraid I may not be able to wear my wedding ring again without getting it sized. Sue’s problems caused by her cut tendon are very sobering, and I’m glad you shared that caution with me. I will keep an eye on this (actually, Glen is, because I can’t really stand to look at it) and hope that it continues to improve. If it doesn’t, I’ll have to bite the bullet and pay for someone to check it out. The photo was taken a day or two after the injury. The swelling has subsided, thank heavens! Sigh. And this is why I’m so clumsy. It’s in my genes from BOTH sides! Speedy recovery, Mumsy! Oh no! Hope you’re back to two-handed typing soon. The book will come out when it’s time, and we’ll all be glad when it does! Thank you, Diana! That alone should be enough to get me back to typing two-handed again! You know my position on the injury, so I won’t use this as an opportunity to nag you again, and I am greatly relieved to read that the swelling has gone down. I wish you a complete and smooth recovery. If it does result in deformity I think you should come up with a better story about how you got it, though- something with a little more oomph and glamour. Or even several stories that you can swap out, depending on the audience. Maybe that you were a double agent and had to karate-chop somebody to get out of a tight spot. Or you had to single-handedly lift a truck off of a little old lady to save her life. See where I’m going here? Get some fun out of the situation. I’m sure the book schedule is a worry but I bet you will stay on track, due to your commitment and work ethic. May your dexterity increase soon so you can type/write/edit to your heart’s content. .
Also, it’s still too hot to cook, so if I were you I would just roll with this, for as long as you can. Until October if you can manage it. ps: Glen is the best! Hahahahahaha!! Oh, Claire, you do make me laugh! Maybe I could spin this into an injury suffered in a high-stakes poker game; I bet there’s a way. Yes! you’re on the right track w/ the poker game. And a bar room brawl! Arm wrestling competition! Roller derby! Roller derby–that’s a really good one! What an awful, miserable thing to do to yourself. I wish you a speedy recovery. After all, you need to be well enough to receive the clutz of the year award. I hear the ceremony is a trip. Hahahahaha!! I’ll be a shoo-in this year. (Glen could’ve won it hands-down the year he ran over his right leg with his own pickup. In fact, he would’ve been the heavy favorite several years running!) Thank you for the good wishes, Julia. And thank you for dropping by to visit! Sorry to hear about your hand! Been there. I broke my left hand 25 years ago & ended up in a cast. I hope your hand it heals well! Thank you so much, Salina! I’m avoiding a cast at all costs. I don’t think I could stand it. (If it were my foot, maybe.) But so far it’s definitely doing better! Ouch! I have broken a few fingers, It hard to do anything without bumping into anything.